The world is still in the process of mourning the loss of Star Wars actress Carrie Fisher, who passed away on Tuesday after suffering a heart attack several days earlier. What's more is that her mother Debbie Reynolds passed away the next day. 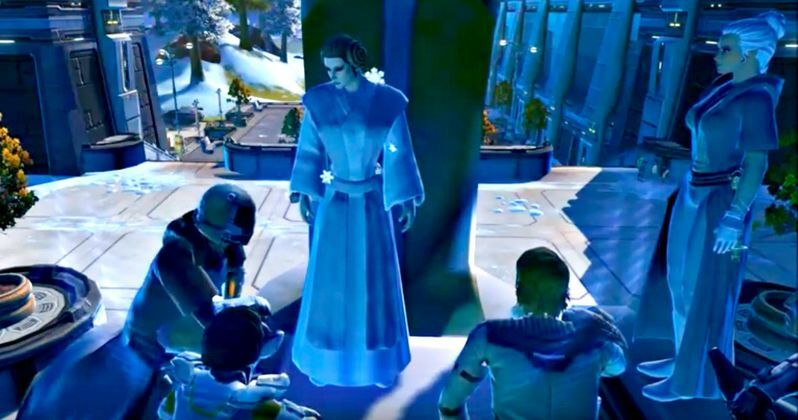 Many fans and people from all over the Star Wars universe have been paying tributes to the actress who brought Princess Leia to life and now, players in the Star Wars: The Old Republic video game are paying their respects in their own unique way. Many people who have been playing Star Wars: The Old Republic over the last few days have been flocking to House Organa, a noble house on the planet of Alderaan, Princess Leia's home world. One particular player took the time to create a character that looks like Princess Leia, who is now standing at House Organa in the Star Wars: The Old Republic online game. Since then, thousands of players from all over the world have gathered to see her there and to pay their respects to Leia Organa. A YouTuber by the name of Kerry Nobbs decided to make a video capturing all of these tributes to Carrie Fisher. The video shows tons of these players gathering in front of the fan-fabricated version of Princess Leia to say goodbye to her. The video is a great way for those who don't play the game to see this very touching tribute and is a testament to just how much Star Wars fans loved her. If you are a Star Wars fan and intend to watch the video, grab some tissues. Here is what Kerry Nobbs had to say about the video. "I, Kerry Nobbs, made this short video of players from Star Wars the Old Republic gathering on Alderaan to pay tribute to Carrie Fisher, who played Princess Leia in the Star Wars movies, who has passed away." Carrie Fisher died at the age of 60, which has been a serious blow to fans all around the world. She will always be best known for her work as Princess Leia in the Star Wars franchise, a character she first brought to life in 1977. However, she was also a very notable "script doctor" in Hollywood, working on scripts for everything from Hook to The Wedding Singer. Still, the world will always know her best as Leia Organa and luckily, we will get to see her in her iconic role one last time. Before her passing, she finished filming her scenes for Star Wars: Episode VIII, so we will get to see her on screen once more next year when the movie comes out. Many people, including J.J. Abrams, Mark Hamill and Oscar Isaac have been sharing tributes to Carrie Fisher online over the past few days, but this tribute from Star Wars: The Old Republic is easily one of the most touching we have seen so far. Fans of Star Wars Battlefront have also been calling for DICE to do some sort of tribute to Carrie Fisher within that game, perhaps with a new outfit for the playable version of Princess Leia or something like that, but that has yet to actually happen. You can check out the video of Star Wars: The Old Republic players paying tribute to Princess Leia for yourself below.